Update: September 9, 2015. iOS 9.1 is slated to include all of the new Unicode 8 emoji characters. This is likely to be released in late 2016. View the full list. The Unicode Consortium has today released Unicode 8, which includes 37 new emojis such as the Face With Rolling Eyes, Hugging Face, Taco, Cheese Wedge and Hockey — both ice and field varieties. In addition, five emoji modifiers are included with Unicode 8, bringing the total number of new characters to 41. Left-Right: Unicode 8 example images for Face With Rolling Eyes, Hugging Face, Taco, Cheese Wedge. Of course, the Unicode Standard Version 8.0.0 (as it is officially known) includes more than just emoji updates, but given the nature of this blog, that is what I will focus on here. Sample images for emojis in this post are for demonstration purposes only. Who chose these emojis? Can I use them today? How do these updates relate to the recent emoji changes in iOS 8.3, Android 5, or Windows 10? All good questions, but first let's take a step through the emoji creation timeline. The Unicode Emoji Subcommittee (Yes, that's a thing) discusses and reviews proposals based on a number of criteria. Expected usage level. Is there a high expected frequency of use? Image distinctiveness. Is there a clearly recognizable image of physical objects that could serve as a paradigm, that would be distinct enough from other emoji? Disparity. Does the proposed pictograph fill in a gap in existing types of emoji? For example, in Unicode 7.0 we had Tiger, but not Lion; Church but not Mosque. Frequently requested. Is it often requested of the Unicode Consortium, or of Unicode member companies? For example, Hot Dog or Unicorn. Generality. Is the proposed character overly specific? Open-ended. Is it just one of many, with no special reason to favor it over others of that type? Representable already. Can the concept be represented by another emoji or sequence? The next release of the Unicode Standard is version 9.0, planned for release in mid-2016. The proposals have already been accepted as candidates. That's right - Unicode 8 was just released and emoji candidates are already in place for Unicode 9. Changes may be made to these candidates: additions, removals, or name changes are possible, though usually kept to a minimum. Consider the Unicode 8 candidates, which changed very little from candidate stage, until being approved today. You see, just because an emoji gets approved, it's of no use to anyone until fonts are released that include these emojis on major platforms such as iOS, Android, OS X and Windows. 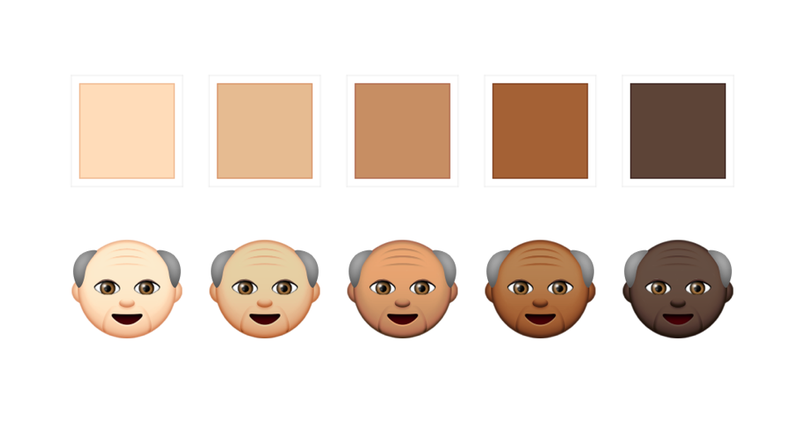 Apple jumped ahead with Unicode 8 and provided support for the Emoji (Skin Tone) Modifiers in iOS 8.3, despite the Unicode 8 Standard being a draft at that stage. Above: Skin Tone Modifiers are part of Unicode 8. Already supported by Apple in iOS and OS X. Yet the middle finger emoji lingers unsupported by most (but not all) platforms, despite being approved as part of Unicode 7 in June of 2014. What I'm saying is that if you are like Roger Federer and craving that Popcorn emoji, it's now in the hands of Apple, Google, Microsoft, and you might be waiting a while. Unicode 7 may have been a misfire, due to the sheer number of new emojis approved, and the utter irrelevance of most inclusions. It's easy to see why Apple or Google may have been reluctant to put resources into emoji-fying this list of of outdated technology, despite there being some gems amongst the list (shopping bags gets a high number of requests, as does the bed). Jason Snell and Myke Hurley touched on the subject of emoji fragmentation in their Upgrade podcast this week, and it goes to show that even the most tech-savvy amongst us can still struggle to know which emojis work on which platforms, or simply different versions of the same operating system. Hopefully with the focus on relevant, popular and useful emojis in this update, we will see them implemented in a more timely manner than has been seen in the past.